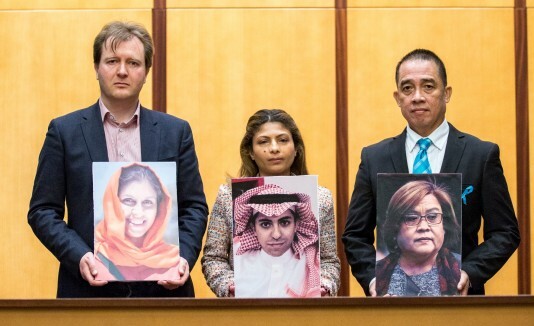 Above: Richard Ratcliffe, husband of Nazanin Zaghari-Ratcliffe, political prisoner in Iran; Ensaf Haidar, wife of political prisoner Raif Badawi in Saudi Arabia; Vicente de Lima II, brother of Senator Leila de Lima, political prisoner in the Philippines. The wife and children of Saudi political prisoner Raif Badawi joined families of political prisoners from Iran and the Philippines this week, together with former political prisoners from Turkey, China, Vietnam and other prominent dissidents, to address the 11th annual Geneva Summit for Human Rights and Democracy. Organized by a cross-regional coalition of 25 human rights groups led by UN Watch, the dissidents’ testimonies focused on issues that Geneva’s 47-nation UN Human Rights Council—under pressure by powerful dictatorships who sit as members—failed to included on its agenda, or only marginally. Opening at the United Nations European headquarters on Monday, followed by a private meeting with diplomats hosted by Canada, the summit held its main event on Tuesday before 800 diplomats, activists and students, gathered from acoss Switzerland, Europe and many other different countries. Tibetan filmmaker Dondhup Wangchen received the 2018 Courage Award, and Nimco Ali, a Somali-British campaigner against female genital mutilation, received the 2019 International Women’s Rights Award.